A better session for the AUDUSD overnight, almost the star performer (only outshone by the Norwegian Krona) as the AUDUSD rallied from below .7100c to close the day at .7170. The rally was prompted by a combination of a weaker U.S. dollar,after PPI data unexpectedly fell into negative territory during August.Also supporting the AUDUSD, was news that the U.S. Government led by Treasury Secretary Steven Mnuchin had invited Chinese officials back to the negotiation table in an effort to avoid an escalation in trade tensions. 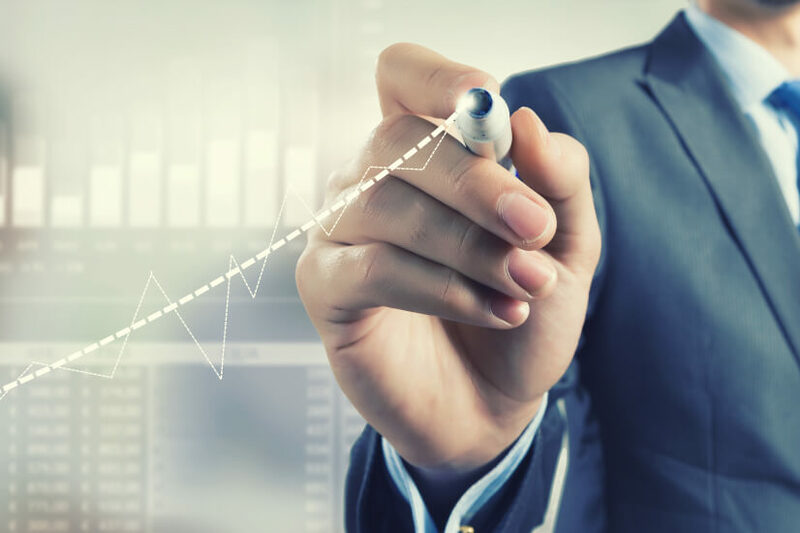 Helping the AUDUSD to take the next leg higher was the release this morning of another robust Australian jobs report, which further reinforces the idea that jobs growth has picked up momentum in recent months. The economy created+44,000 new jobs during August, effortlessly beating consensus estimates of +15,000 with the unemployment rate remaining at 5.3%, despite an uptick in the participation rate to 65.7%. The strong jobs report coming hot on the heels of last weeks GDP number, which showed the economy grew at its fastest pace in six years. While the AUDUSD is enjoying a relief rally courtesy of the factors mentioned above, a research piece released overnight by a prominent U.S. investment bank, has highlighted that if the U.S. Government were to go ahead with the implementation of the next tranche of U.S. $ 200 billion dollars of tariffs, it would have only limited downside effects on Australia. This is because in an effort to support growth, Chinese policy makers would again increase both credit growth and spending. Stimulus that would look a lot like the episode of 2015/16 which gave Australia’s commodities prices a healthy boost. 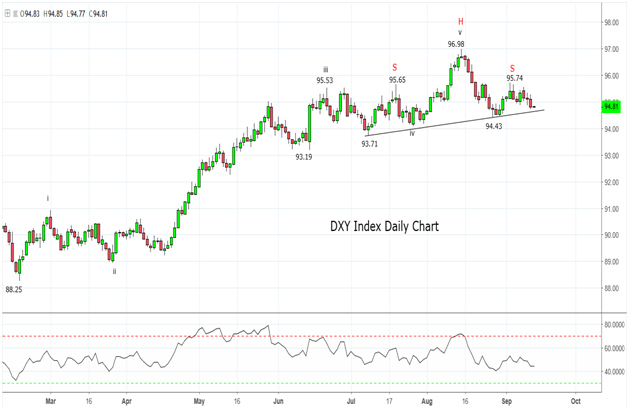 Before we do look at the AUDUSD chart, I would like to firstly highlight a potential topping pattern in the U.S. dollar index, the DXY which we first drew attention to on our Twitter feed on Tuesday of this week. Overnight, the legendary macro investor and thinker, Raoul Pal echoed similar thoughts on Twitter. We certainly aren’t suggesting Raoul saw our idea, however it is nice to think that perhaps we are on the same page as one of the best! As can be seen on the chart below, a break and close below the neckline 94.43/40 area, confirms a head and shoulders top and that a deeper pullback in the U.S. dollar has commenced. With the market still extremely long U.S. dollars,a useful chart to safeguard the bullish U.S. dollar view. 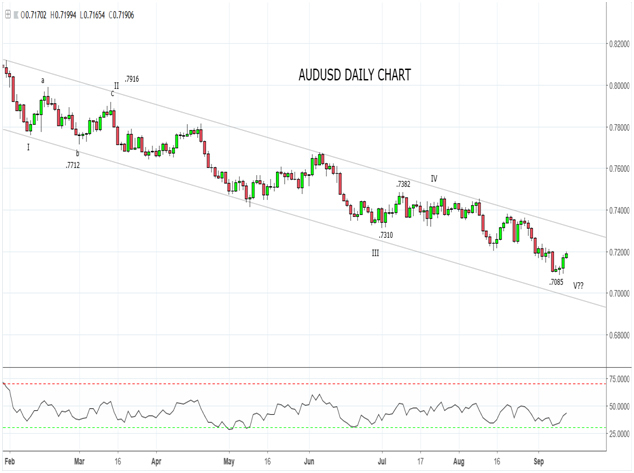 Turning to the AUDUSD chart, the AUDUSD remains firmly in a downtrend, yet the recovery of the last 24 hours sees the AUDUSD now testing, key short-term resistance .7210/40. Should the AUDUSD, break and close above .7240 it opens up a test of the top of the trend channel, .7320 region. A break and close above .7320 would then confirm .7085 as a medium term low and enable the AUDUSD recovery to continue back towards .7500c. Conversely, an inability to reclaim .7210/40 keeps the downside exposed with .7000c the next downside target before the January 2016 low of .6826.